Publisher: Thousand Oaks, Calif. : Corwin, c2010. 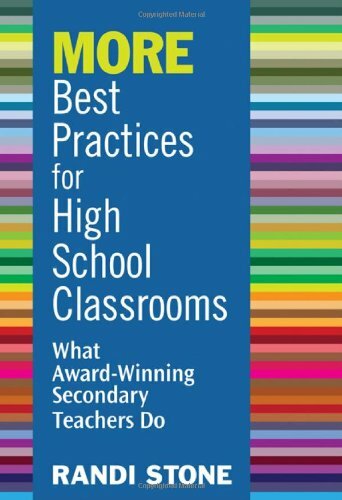 Outstanding high school teachers share award-winning practices for managing classrooms and using technology, and for teaching science, mathematics, language arts, social studies, music, art, and physical education. Randi Stone is the author of nine Corwin Press books: Best Practices for Teaching Reading: What Award-Winning Classroom Teachers Do, Best Practices for Teaching Social Studies: What Award-Winning Classroom Teachers Do, Best Practices for Teaching Writing: What Award-Winning Classroom Teachers Do, Best Practices for Teaching Mathematics: What Award-Winning Classroom Teachers Do, and Best Practices for Teaching Science: What Award-Winning Classroom Teachers Do. She is a graduate of Clark University, Boston University, and Salem State College. She completed her doctorate in education at the University of Massachusetts, Lowell.